Interlocutor: Master, Why do animals die massively in many parts of the world? For example, there’s the case of as many as 5000 dead red-winged blackbirds in Arkansas, an autopsy revealed that they had internal hemorrhaging, which caused blood clots that killed them, according to news from the Associated Press, scientists said that the trauma that killed them was due to fear. 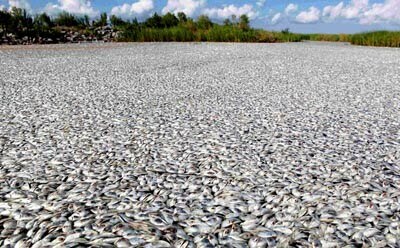 There are other cases: The 100 tons of fish, sardines, croaker and catfish that have turned up dead on the coast of Parana. People talk about secret tests on weapons of the U.S. government and they also talk about extraterrestrials. 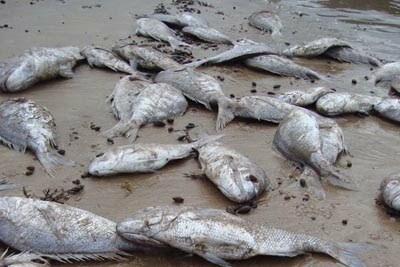 Another case mentions 500 kg of dead octopus that were found on the Portuguese beach of Vila Nova de Gaia. 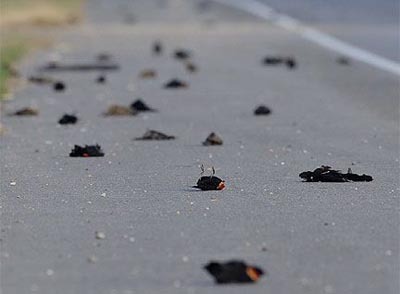 Around 700 dead birds were also found, mostly pigeons, on a road in the city of Faenza, province of Ravenna, Italy. This seems to be almost a global disaster... Is it provoked by a single source? I also have here a case about the growth of mortality in whales near to the Patagonian coast. Are these cases also related? Interlocutor: Nothing to do with chemtrails? Ruanel: Yes. This waste was studied and they found that it was not going to affect the dominant race on this planet, the Homo sapiens sapiens, but it’s true that it has affected some bird species. That's true. Interlocutor: But how much? Did they throw away thousands of tons of waste? Ruanel: …Into the atmosphere, it spreads easily, it has even fallen into the ocean and it has affected marine species, not only fish but also cetacean animals. Ruanel: Negligence in a certain percentage. Interlocutor: Are we talking about the United States? Interlocutor: What is the percentage in each case? Interlocutor: Is that so high the terrestrial influence? Ruanel: Yes, to that extent. Interlocutor: And what about these scientists? Can you identify the country? Or shouldn’t we…? Interlocutor: And these scientists, from the country of the North, Do they know they are causing that damage? Ruanel: Of course they know it, by making an autopsy directly to birds or fish; they are going to realize that these animals have their cognitive functions altered. It is commonly said that animals do not have abstract thinking; they do have it, although in a smaller percentage. Interlocutor: Okay. And the issue about the whales. Is it caused by aliens or terrestrials? Ruanel: In this case, the vast majority is provoked by humans. Interlocutor: Is there anything else about this issue, Master? Interlocutor: Master, What about the aliens who were causing the Chemtrails, Are they still doing it? This entry was posted at Saturday, March 19, 2011 and is filed under Secrets . You can follow any responses to this entry through the .